A non-profit foundation that makes opportunities for K-12 Washington State students to gain the knowledge, guidance and opportunity to pursue a career in the maritime world. Brazil is a country with a coastline over 7,000 km long, bathed to the east by the Atlantic Ocean. Along this coastline and offshore is where the country develops its fisheries activities, maritime trade and the exploitation of a variety of biological and mineral resources. The incredible environmental and financial wealth found in these waters, and under the seabed gave way to the term - Blue Amazon – relating to the Amazon Jungle. The Blue Amazon officially covers an area of 3.5 million square kilometers. However, Brazil is calling on the United Nations to expand its borders to the limits of the continental shelf, which should raise the sea area to about 4. 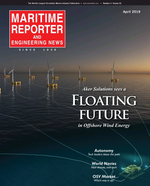 GasLog Partners, which owns, operates, and acquires liquefied natural gas (LNG) carriers under multi-year charters, said that the longer-term outlook for natural gas demand continued to strengthen in the first quarter of 2019.Despite LNG demand in the first quarter of 2019 being negatively impacted by warmer than usual weather in the Northern Hemisphere winter, global LNG imports during the period totalled 88 million tonnes (mt), compared to 79 mt in the first quarter of 2018, or 11% growth, according to Poten.In particular, China’s LNG imports totalled 15.3 mt, 24% growth over Q1 2018. The President says he wants to make American great again, so why is he trying to destroy the principal support system for America’s maritime industry? This week, we learned that President Trump is “seriously considering” issuing a broad waiver for the Jones Act, a critical law that requires domestic shipping in the U.S. to occur on ships that are built in the United States, fly the U.S. flag, and are operated by crews consisting of at least 75 percent American citizens.I served as the top Democrat on the House Subcommittee of Coast Guard and Maritime Transportation for six years. Through that experience I gained a firsthand understanding of how vital the Jones Act is for our nation. Farm supplier CHS Inc has dozens of loaded barges trapped on the flood-swollen Mississippi River near St. Louis - about 500 miles from the company's two Minnesota distribution hubs.The barges can't move - or get crucial nutrients to corn farmers for the spring planting season - because river locks on the main U.S. artery for grain and fertilizer have been shuttered for weeks. High water presents a hazard for boats, barges and lock equipment.Railroads have also been plagued by delays from winter weather and flooding in the western Midwest, further disrupting agricultural supply chains in the nation's bread basket.The transportation woes are the latest headache for a U.S.
Navies operate on a spectrum between deterrence and defense, to include offensive operation, support of foreign policy, and power projection to civil affair and humanitarian assistance and disaster response. Many have constabulary responsibilities, and it could be argued that, with the exception of the largest navies, most are more like a coast guard than a military force in their normal responsibilities.Every Navy is different. Yes, they all share similar challenges of acquisition, maintenance, manpower, basing, communications, information systems and the usual requirements of a military service, compounded by harsh maritime environment.